For 10 days in May, Hay on Wye is full of stories, ideas, laughter and music. The Hay festival runs from 25th May – 4th June 2017 and attracts the most exciting writers, filmmakers, comedians, politicians and musicians to inspire, delight and entertain. With some of the most beautiful scenery in the UK on your doorstep, there’s no excuse not to have a spring in your step. 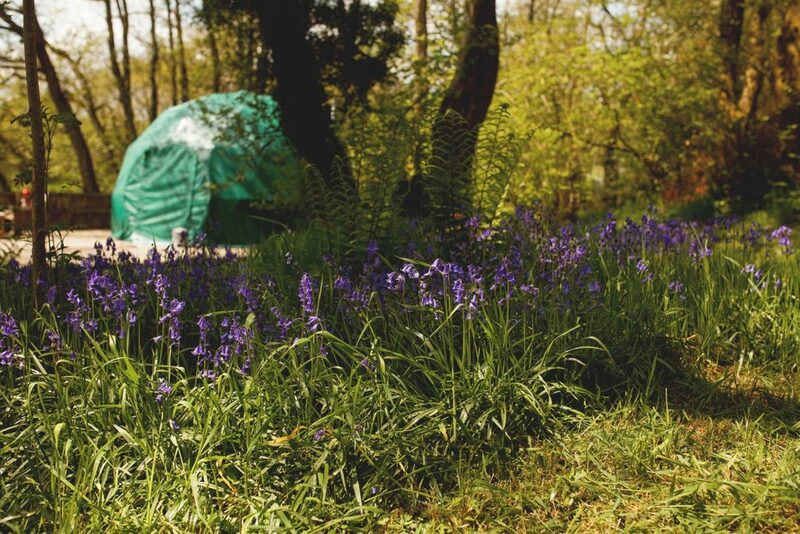 There are so many opportunities for an amazing walk around Cosy Under Canvas you’d be crazy not to dust off your walking boots and enjoy the countryside. From mountains to moorland, ridges, valleys, canal banks, rivers and woodlands we’ve got them all. We can advise on routes, mark up your map and send you off with a packed lunch. Whatever the weather there’s something entertaining for kids to do at Cantref. From animal barns and indoor play areas and animal shows, outdoor rides and paddle boats – and even a horse riding centre, you can be sure of a great day out. From the 7th – 23rd April there are daily Easter Egg Hunts, as well as spring lamb feeding. Find out more at www.cantref.com. The Brecon Beacons National Park is mountain bike riding at its best. 14 marked cross-country routes ranging from basic level to all-day hammer-fests. With five different biking hubs within the national park, there’s loads to explore – the Mountain Biking the Brecon Beacons site gives you the lowdown on the different routes. The 20th & 21st May play host to this celebration of rural life. With a busy programme of entertainment and educational activities, free workshops, displays and main ring performances, the festival makes a great day out for all the family. With over 1,300 livestock, poultry and horses, the only Premier Open Dog Show to be held in Wales, children’s activities, a food and drink quarter, vintage machinery, auction, country leisure there’s plenty to do. And on Saturday they’ll be open late, allowing you to listen to local bands, taste the street-food and enjoy the early summer’s evening. Light pollution across the UK creates real challenges for people wanting to see the wonders of the night sky in its full glory. The Brecon Beacons’ small population means that the area does not suffer from light pollution and has, in fact, been designated a ‘Dark Sky Reserve’. As the weather brings clearer skies, it’s the perfect time to see the wonders of the spring sky. With Ludlow’s fantastic reputation for good food and drink, it’s not surprising that their Spring Festival is well worth a visit. Taking place from the 13th – 14th May 2017, the festival features over 60 local food and drink producers and 200 real ales, as well as live music and over 180 classic cars. 8. Go Adventure Fly Fishing With The Wye And Usk Passport. The fly fishing season begins on March 3rd on both the River Usk and River Wye, and as the spring days warm up, the emergence of flies from mid-March makes for some great sport. The Wye and Usk Foundation have spent many years opening up the small tributaries that flow in to the two main rivers and in doing so they have created many more fishing opportunities in some exciting and quite remote spots.